Watertown Remembered, Elmer C. Kiessling, 1975, p 63. 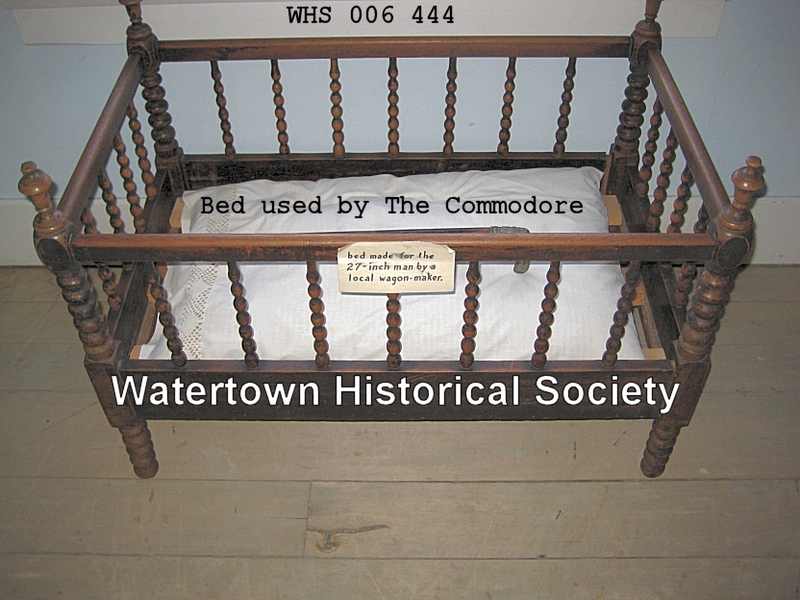 Watertown—Today, in the little cemetery at Ixonia, Jefferson county, there was laid away, to its final rest, the body of John Lewis, the smallest man in America, and with scarcely a rival in the world for diminutiveness. As previously announced in these dispatches. Lewis died on Monday, March 21, at the home of his parents in the town of Ixonia, six miles east of this city of congestion of the stomach, after a brief illness. John Lewis was born in the town where he died in the year 1857, and was therefore 24 years of age at the time of his decease. His parents, Lewis and Catherine Lewis, are natives of Wales. Their union has been blessed with seven children, three sons and four daughters, the dwarf son being the oldest. With the exception of John all their offspring are of full average size, well formed and of good intellect. As a baby John was of fair average size, but appears not to have grown much after his second year. 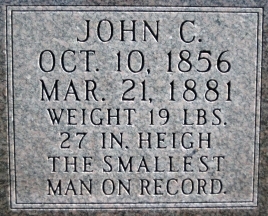 This wonderful little man was only 27 inches high, and his average weight of late years only 19 pounds. Tom Thumb, considered at one time so much of a prodigy, for smallness of stature, is about 40 inches high and twice the weight of Lewis. Even Commodore Nutt seemed tall by the side of the Ixonia dwarf. Lewis had a round face with an intelligent look, blue eyes, black bushy hair and fair complexion. He was perfect and symmetrical in form except that his hands were without thumbs and one foot was club and slightly turned in at the ankle. He was fond of dress. His favorite coat was the conventional blue frock with brass buttons. It was invariably found impossible to find a hat small enough to fit him, which made it necessary to make one for him expressly. When dressed in his best he looked like a miniature Broadway swell. 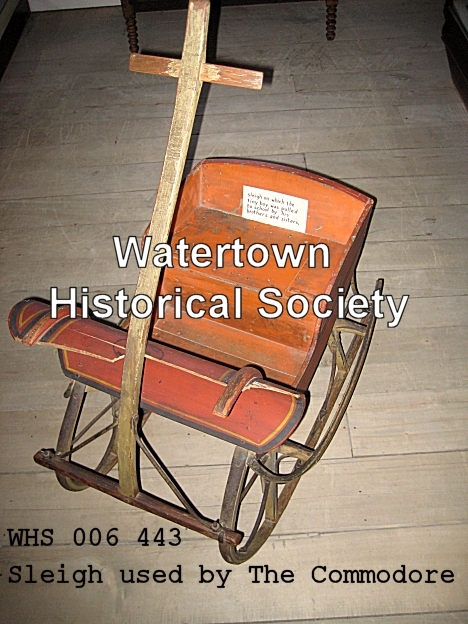 He received a common school education such as his neighborhood afforded, and was generally taken to the school house, one and a half miles distant, in a little wagon drawn by his brothers and sisters. He was a bright scholar, both in the English and Welsh languages, especially noted for his retentive memory, and could repeat most the New Testament by heart. He was possessed of considerable religious zeal, attending church services as regularly as possible, and was invariably able to repeat the text and tell the part of the bible it could be found in when he returned home. In the Ixonia Welsh Methodist church, of which he was a member, the privilege was generally accorded him of giving out and reading the hymns, which he did standing on the pulpit, a small, to be sure, but no less earnest specimen of the church militant. But notwithstanding his fervor as a religionist, the ungovernableness of his temper often got the mastery of him. 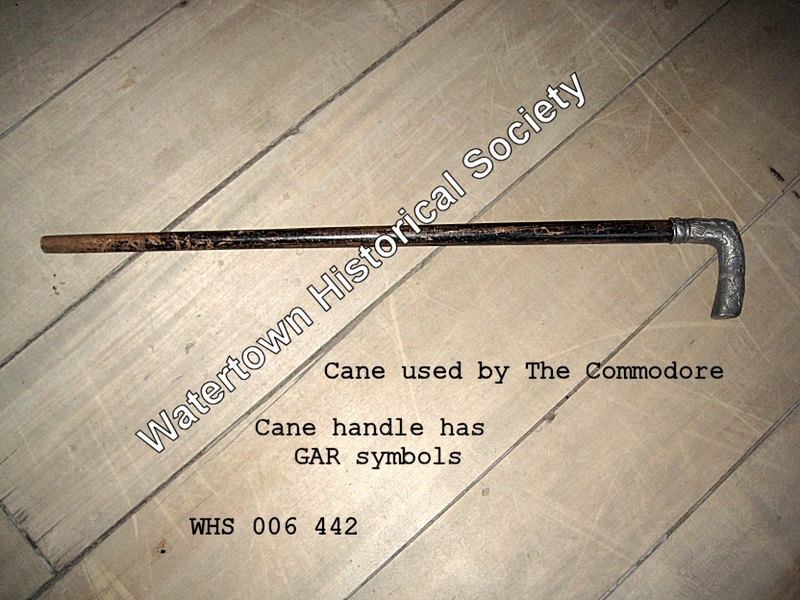 When angry he was quite desperate and used to make it very unpleasant for the members of the household, many a time chasing his brothers and sisters out of the house, on such occasions using his club foot as a weapon to the best possible advantage. He even maintained by his conduct that though he had been out-stripped in size, he was complete master of the hearthstone. He made a study of agricultural topics, and was greatly interested in all matters pertaining to the work of the farm, remembering clearly the different kinds of grain the fields in previous years had been sown with. A strange peculiarity he possessed of pulling off his coat at meals and keeping on his hat. He was a hearty eater and a great tea drinker. The disease of which he died was no doubt the result of his ravenous appetite. Our diminutive friend had a great aptitude for making money. When a pig was given him by his father the circumstance did not by any manner of means furnish an illustration of the adage, "boy's pig and daddy's bacon," for the progress in the growth of the animal was closely watched, and when killed the money obtained from the pork was in the little man's pocket. So in the case of a hen. Her laying and incubations were properly noted and the profits accruing placed where they would do the most good. 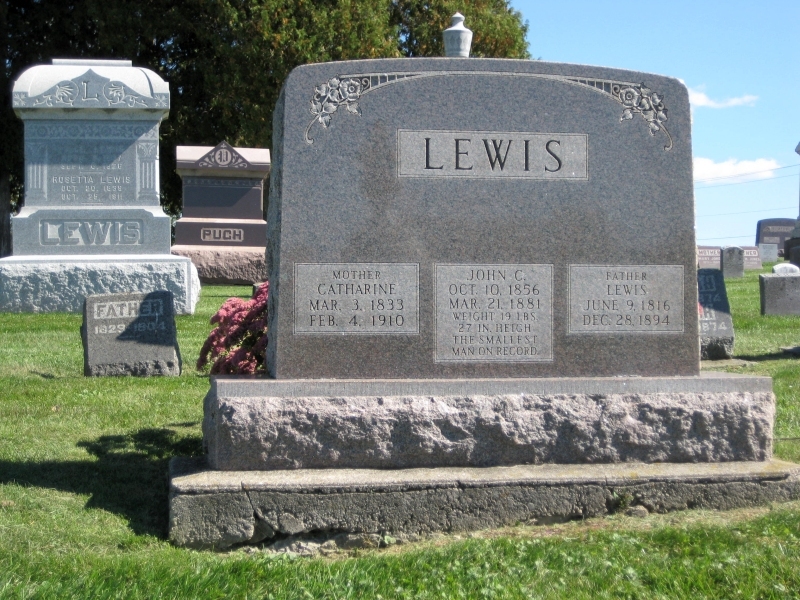 In this way Lewis had accumulated some $400 at the time of his death. The farthest he ever was away from home was when he attended a Welsh church synodical convention at Oshkosh a few years since. He never exhibited himself, although numerous offers had been made him to do so. Barnum had obtained his photograph and wrote him on the subject of making an engagement with him for exhibiting. Other parties corresponded with him, having the same object in view, but to all such he turned a deaf ear. Rev. T. R. Jones, of Randolph, Wis., tried to persuade the little fellow to take a trip with him to Wales, and from there they would go to Australia, where a large number of Welsh people are settled, but without avail. Mrs. Lewis was very emphatic in her determination that her dwarf son should never leave his home, especially for the purpose of showing himself to the public. She always took great care of him, and, of course, on account of his misfortune, her feelings, perhaps, were more tender for him than for any of her other children. When Tom Thumb and Commodore Nutt exhibited here some eight years ago, John Lewis came to see them. All three of these men midgets were greatly interested in one another. Nutt admitted he was beat, but pointed to Lewis' hands and foot as an offset for over-height. Thumb had nothing to say, being almost a giant compared with the Ixonia diminutive specimen of humanity. An additional peculiarity of his memory might be mentioned here, was that he never forgot a name, something that few of more robust body and greater intellect than he can boast of. 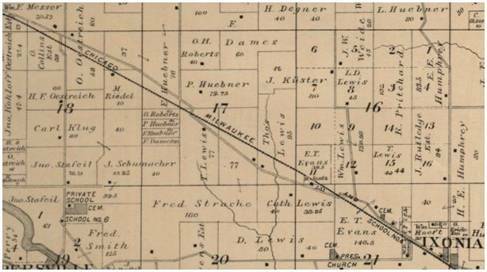 John Lewis exercised the right of suffrage for the first time last fall, Garfield receiving his vote for president, and Humphrey E. Humphrey [E. E. Humphrey noted on plat map], Democrat, who was his neighbor and friend, for assemblyman. From this it will be seen that General Garfield had not only the largest support but the smallest supporter in the country. Taken, all in all, John Lewis was one of the most remarkable personages this country has produced, and the entire world's history may be challenged to show many greater curiosities of humanity than the Ixonia dwarf. Cross References: Same text as above article also appeared in Omaha Daily Bee., April 01, 1881. The Eternal Rest of the Story, by Dennis McCann, 2000. 10 14 2010 Nepalese teen named world's shortest man—Kathmandu, Nepal (CNN)—A Nepalese teen who is the size of a toddler turned 18 and entered the record books as the world's shortest man. Khagendra Thapa Magar is 67.08 centimeters (26.4 inches) and weighs 6.5 kilograms (13 pounds), said Marco Frigatti, vice president of records at Guinness World Records, who flew in from London for the recognition. A businessman discovered Magar four years ago in remote Baglung district. Since then, he has been the center of attraction at fairs across the country, with organizers paying to exhibit him. Magar replaces Edward Nino Hernandez, 24, of Colombia, who measures 70.21 centimeters (27.4 inches). Hernandez had been declared the shortest living man after Chinese national He Pingping died in March. Magar is a resident of Pokhara, 124 miles west of the capital, Kathmandu. Cemetery is located on CTH "P" in Ixonia Township, about 1 mi west of Ixonia. This cemetery is owned and maintained by the Bethel Welsh Presbyterian Church. The cemetery is situated by the church on the north side of the road.